Finding the right personal injury lawyer for your case can be a challenge. Every case is different and can require specificities that you need to check with in advance. 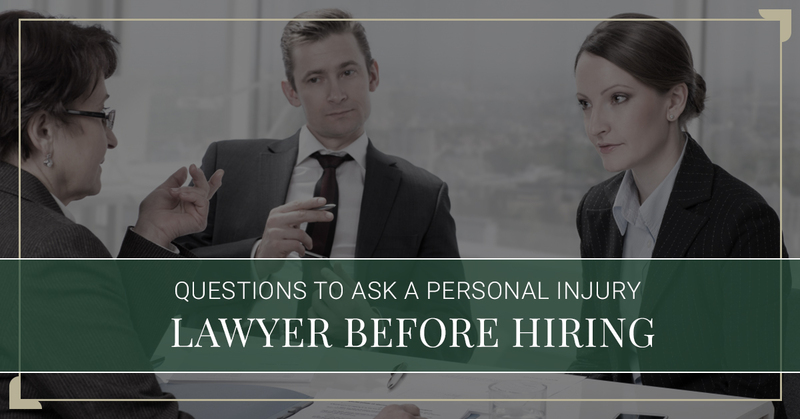 In today’s blog post, we’re going to touch on a few of the questions that you should be asking when you’re looking to hire a personal injury lawyer that will ultimately help you find the right individual for your case. Getting your car fixed by an airplane mechanic or having a baby delivered by a dentist are things that simply don’t make sense, even though technically they are both mechanics and both doctors. The point here is, every profession has some type of specialization that needs to be taken into consideration upon hiring. The same is to be said about the lawyer that you hire. Ask the lawyer what type of law they specialize in, first and foremost. If they answer with anything other than “personal injury law” then you know it’s time to continue the search. While a lawyer that doesn’t specialize in personal injury law would still be able to present some sort of case to the court, you don’t want your case to be anything less than sound. In order for that to happen, you need a lawyer that truly understands all the twists and turns of this area. Even the lawyers that specialize in a personal injury law may have never seen anything similar to your case before. For that reason, it’s essential that you ask the lawyer that you’re considering hiring whether or not they’ve worked on anything similar. Having worked on a case like yours will most importantly show you that your lawyer is going to have an idea of where to start and what they need to succeed. In these cases, you can also ask the lawyer how the case played out and what the final verdict was. These types of things are a great way to gain some insight on how experienced your lawyer is and how you can anticipate the case going. At times, more than the lawyer that you’re talking to will be working on your case, so it’s important to figure out who is going to be touching the case right from the beginning. Asking your lawyer if there will be any others that are working on your case is a must just because you should know who will actually be representing you in court and who will be building up the case. If you have a specific attorney that you want to work with then it’s important you ask this before agreeing to work with someone. There are so many different factors that will play a part in your case, and it’s crucial that your lawyer is upfront about them with you. As you go about finding a lawyer and presenting your situation to them, ask them how long they anticipate your case taking. With personal injury cases, medical bills and work can quickly pile up and make life even more difficult. Asking them will give you a feel for the plan that you need to make and how your life could potentially be affected in the process of the case. In just about every profession a solid means of communication is something that you should be looking for, but it’s imperative when talking about a legal case. As we just mentioned, life can change quite a bit in the process of solving a case, so communication is very important throughout the process of your case. Figuring out how your lawyer is going to communicate with you throughout the case and determine from there whether or not that will work for you. One of the things that you definitely need to be comfortable doing is asking questions when you have them — especially when it comes to your lawyer. If there are any questions that you have or there are any items that you’re not entirely sure you understand don’t be afraid to ask. The comfort level that you have with your lawyer is crucial because transparency is going to be a must through the duration of your case. Contact Woods & Thompson P.A. Woods & Thompson P.A. specialize in personal injury law, and we know we could help you out with the injury case that you’re dealing with. Our team of personal injury lawyers, located in Twin Cities, is dedicated to finding solutions for the clients that turn to us for help. Contact our team today for a consultation on your case or for any questions or inquiries that you may have about your case.